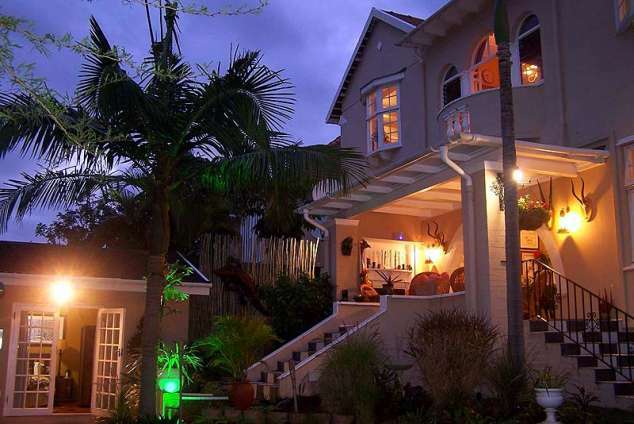 Acorn Bed & Breakfast in Durban - Berea, Durban Accommodation. High up on Durban's Berea, Acorn Bed & Breakfast is an exclusive, secure and private getaway, with every amenity available to ensure that your holiday or business trip is memorable and totally hassle-free. 6 en-suite rooms with air-cons, TV's, radio's and ceiling fans. Little private office with 24 hour free wifi via fibre optic line and PC with spreadsheet and word-processing packages. Beach Equipment: Umbrellas, towels, etc. The gracious old 1930's home has retained it's colonial grandeur of old, and the décor includes original artworks, comfy leather furniture. Walls of books, historic pictures, persians and the odd wildlife trophy to add to the romantic "Out of Africa" colonial safari décor that is the B&B's signature. All linen is of the highest international standards, from the guest bathrobes through to the 100% cotton percale linen on the beds. Attention to detail, such as "Sherry trays" in the rooms at night, to the turned down beds with "goodnight" stories... make a stay an experience. In the private manicured B&B gardens include a thatched lapa... just to relax under with a drink or a good book, and there is a secluded braai and dining area with Weber, should you want to eat "under the stars". The sparkling pool is set amongst tropical palms, and is totally private should you wish to just lie around relaxing, or have a quick dip after work. For corporates, we have all modern amenities including free wifi via fibre optic line, private gardens for functions, skype, fax, computers, as well as a private kitchen for on-site catering. The guesthouse is in close proximity to the "hustle and bustle" of all the restaurants and clubs on Florida Road and the Musgrave center, and the Absa Stadium and beaches are a mere 5 minutes drive away. We can organize day trips to game reserves, as well as golf games or water sports... to name but a few. So... you just bring yourselves, settle in, and get right down to the business of feeling at home. Take signs for Durban out of airport. Get onto N2 heading North (Signs for "North Coast/Pietermaritzburg"). At N3 interchange (Spaghetti Junction), glide off to the left, and stay in the right lane, as the Durban fork glides off to the right. Take the Tollgate or Berea exits onto Berea Road North. Continue to ESSENWOOD ROAD. then turn LEFT into Essenwood (It's a one-way now). At the 3rd large intersection, Turn RIGHT down the hill on MARRIOTT ROAD. Go over Musgrave, and your first right after Musgrave is WOLFENDEN GROVE. We're at #3 (Big "Acorn B&B" sign outside). Head South on the N2. Glide off left (then left again) at the N3 interchange. Take the Berea/Tollgate glide off ... and continue as above. On the Coastal Road, heading South. You will pass the large Sun Coast Casino on the Left. At the next large intersection (ARGYLE ROAD), turn RIGHT. Continue to COWEY ROAD (6th set of lights). At 2nd set of lights (MARRIOTT ROAD) turn RIGHT up steep hill. Go OVER CURRIE, and WOLFENDEN is the second little road on the left after Currie. Get onto STANGER STREET out of the city (heading North). (Stanger Street is perpendicular to West and Smith which run the length of the city center. Take the ARGYLE ROAD off ramp to the left. Tip: If you're lost, get to a landmark such as the MUSGRAVE CENTRE, and we're a stone's throw from there. 46965 page views since 26 May, 2006.